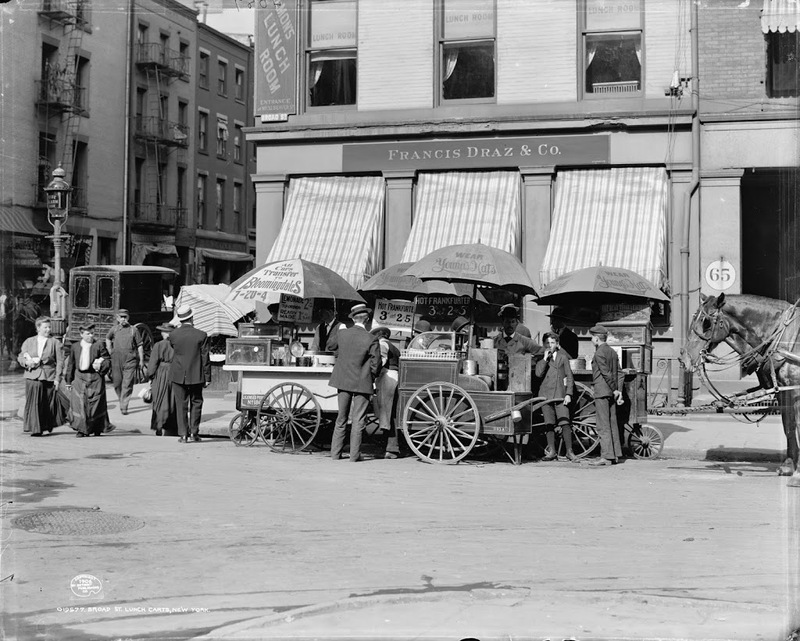 Lunch carts at the corner of Broad Street and Beaver Street, in the Financial District of New York City, around 1906. Image courtesy of the Library of Congress, Detroit Publishing Company Collection. The view looking north on Broad Street between 1900 and 1910, with the New York Stock Exchange in the left-center. Image courtesy of the Library of Congress, Detroit Publishing Company Collection. 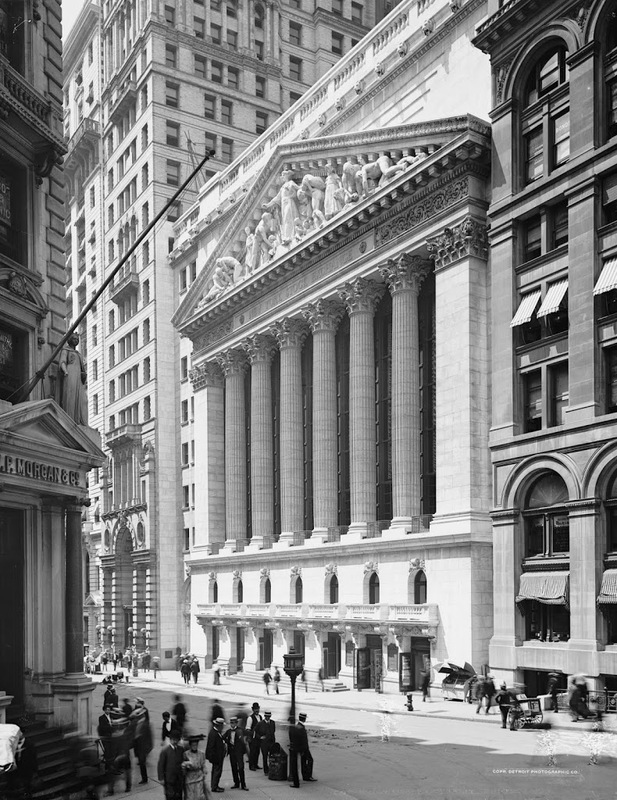 A few buildings from the early 1900s photo still exist today, perhaps most notably the New York Stock Exchange and the Federal Hall National Memorial. 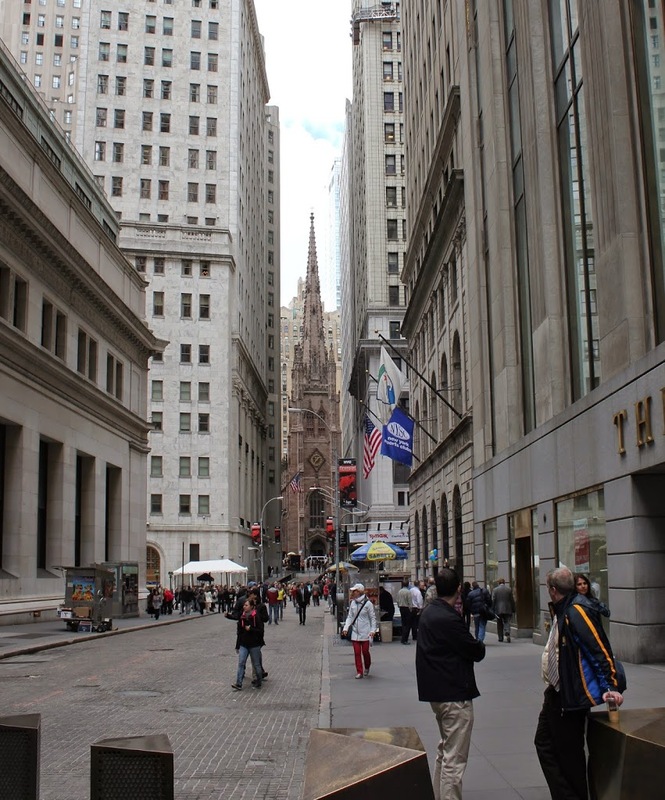 Just as it was 100 years ago, Broad Street is at the heart of the American financial industry. In the first photo, though, there are actual financial transactions going on, right in the street. This was the location of what was called the Curb Market, where brokers would buy and sell shares outside. This was often the way for investors to buy shares of small companies in highly speculative markets that would not be eligible for the New York Stock Exchange. The curb market practice of trading outside – regardless of weather – eventually ended in 1921, when the market moved to a permanent, indoor location. 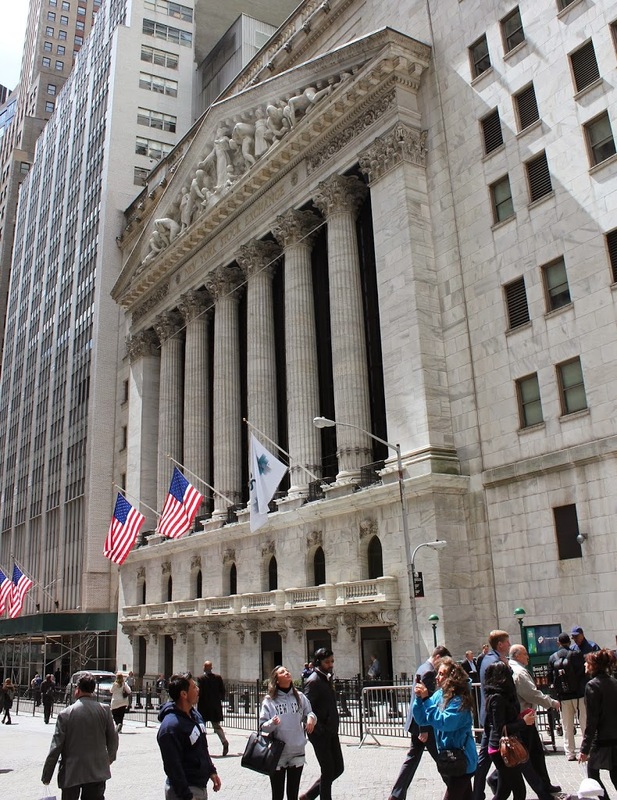 However, the market itself survives today, as NYSE MKT, formerly American Stock Exchange (AMEX). A close inspection of the first photo reveals a fascinating glimpse into everyday life a century ago. Of course, almost all of the people visible in the photo are men, and nearly all of them are wearing identical three-piece suits, with bow ties and identical straw hats. Many of them likely dined at Barron’s cafe and buffet lunch on the right-hand side of the photo, and perhaps purchased “Special Blank Books” from William F. Albers’s business, as advertised on the carriage in the lower right corner. I don’t know how they got home, but they likely didn’t take the subway; New York City’s first subway line opened in 1904, but the Broad Street station visible on the far right of the 2014 photo didn’t open until 1931, by which point many of the younger curb market brokers in the photo had probably gained a fortune in the Roaring Twenties, only to lose it in the crash of 1929. 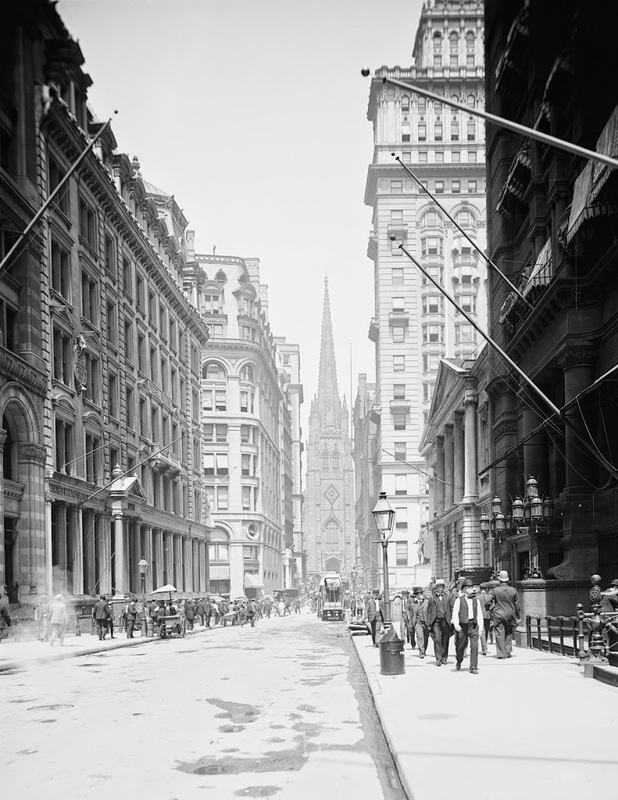 The view looking up Wall Street around 1903, with Trinity Church in the distance. Image courtesy of the Library of Congress, Detroit Publishing Company Collection. 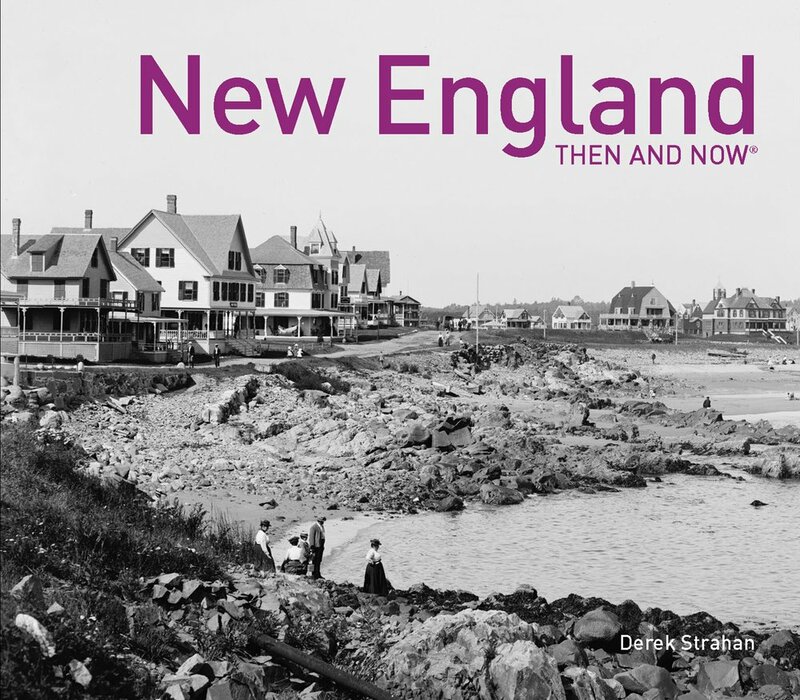 Perhaps ironically, the only building visible in both photos is also the oldest building that is readily visible in the 1903 photo. Trinity Church, located on Broadway across from Wall Street, was completed in 1846, and its steeple made it the tallest structure in the city until the completion of the New York World Building in 1890. Today it is dwarfed by the 20th century skyscrapers of the Financial District, but it remains a fixture in the area. 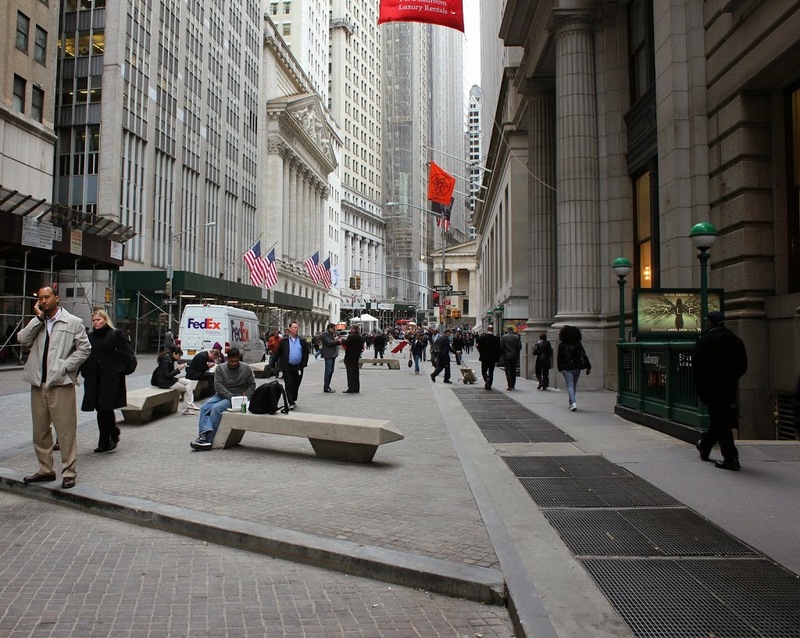 Today, this area of both Wall Street and Broad Street is closed to vehicular traffic. 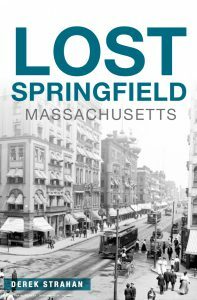 There is another building that is (sort of) seen in the 1903 photo and still exists today, although it isn’t visible in the 2014 photo. The Federal Hall National Memorial, formerly the US Customs House, isn’t really visible, but the statue of George Washington in front of it is barely visible, on the right-hand side of the intersection of Broad & Wall Streets. The building was built in 1842, on the site of Federal Hall, which was formerly the first capitol building of the United States, and the location of the first inauguration of George Washington. 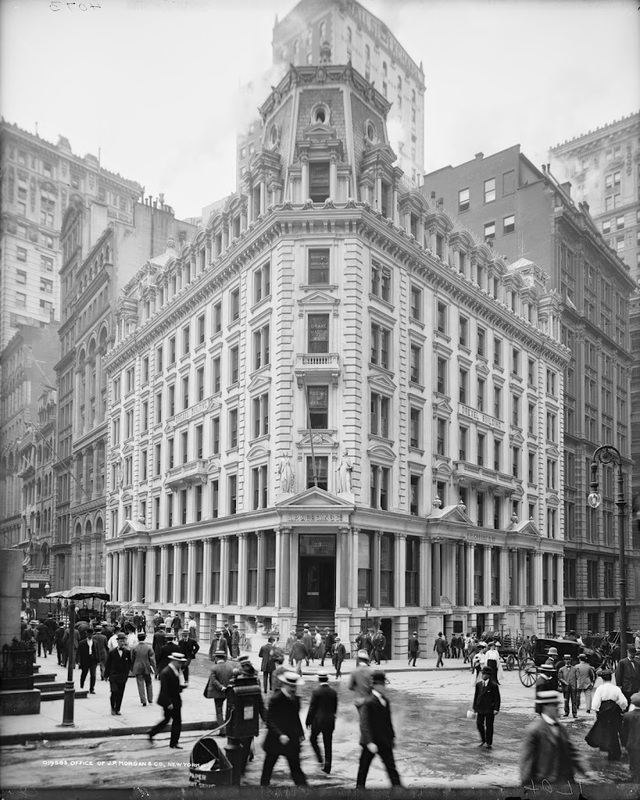 The headquarters of J.P. Morgan & Co., at 23 Wall Street, between 1900 and 1906. Image courtesy of the Library of Congress, Detroit Publishing Company Collection. 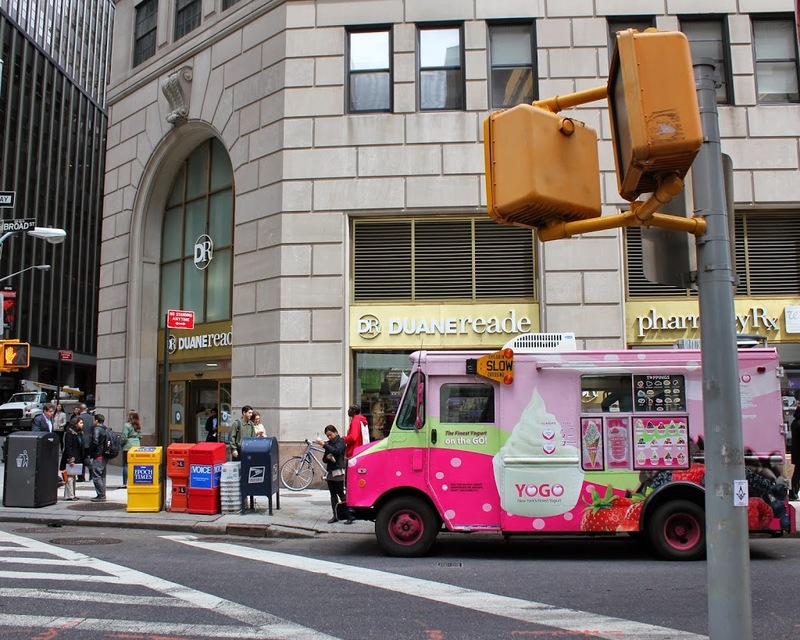 Both buildings in the photos were owned by J.P. Morgan & Co., directly across Broad Street from the New York Stock Exchange. 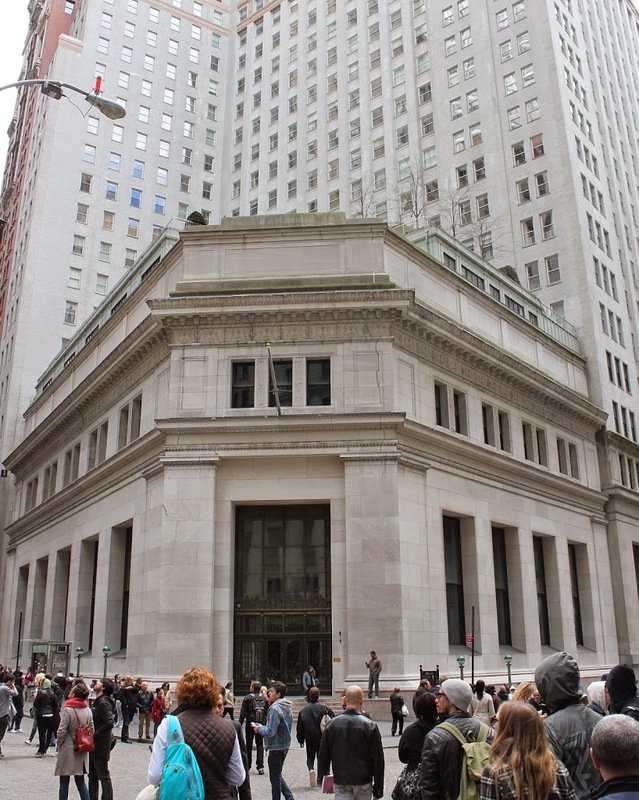 However, in an unusual reversal, the taller building was replaced with a much shorter building, which was completed in 1913, the same year that J.P. Morgan died. Intentionally built only four stories high in a neighborhood surrounded by much taller buildings, it showed off the fact that the company was able to afford using such a high-value lot for such a short building. It was the target of the September 16, 1920 Wall Street bombing; much of the interior was destroyed, and the shrapnel damage is still visible on the exterior of the building. The New York Stock Exchange around 1904. Image courtesy of the Library of Congress, Detroit Publishing Company Collection. 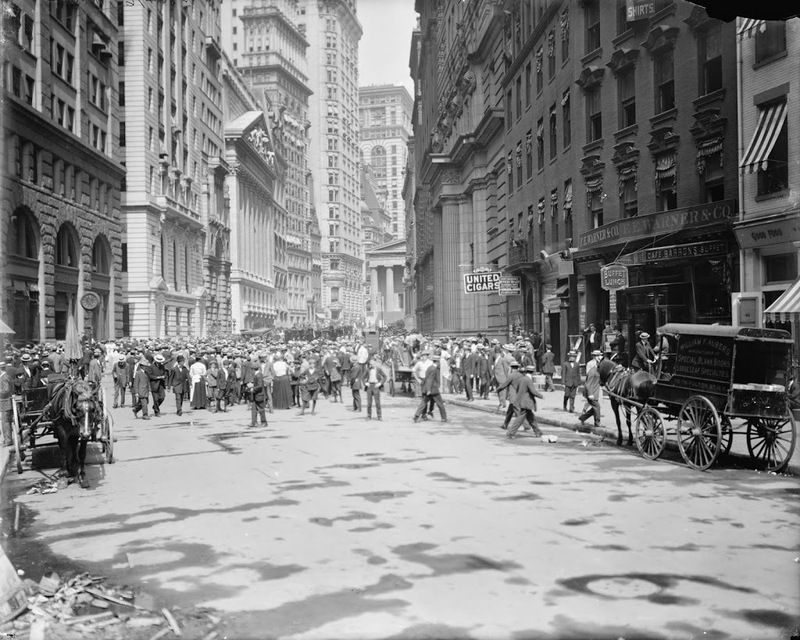 The first photo was taken right around the time that the current New York Stock Exchange building was opened, and in the intervening years the building saw the 1920 Wall Street bombing, the economic boom of the 1920s, the 1929 crash and Great Depression, all the way up to the September 11 attacks and the latest economic recession. 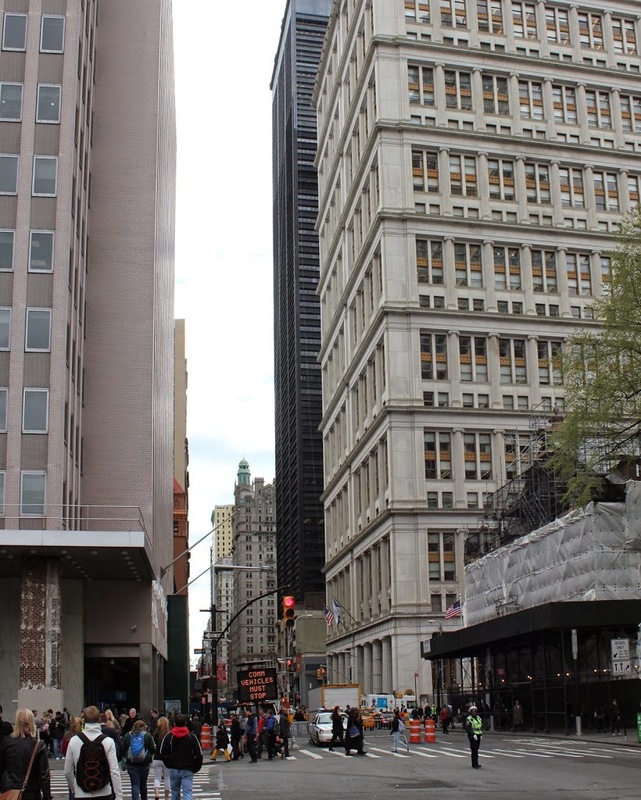 Today, it is still at the heart of the financial district, and it is also a major tourist site, as seen in the 2014 photo. The view looking south on Broadway between 1905 and 1908, toward the Singer Building, which was under construction at the time. Image courtesy of the Library of Congress, Detroit Publishing Company Collection. 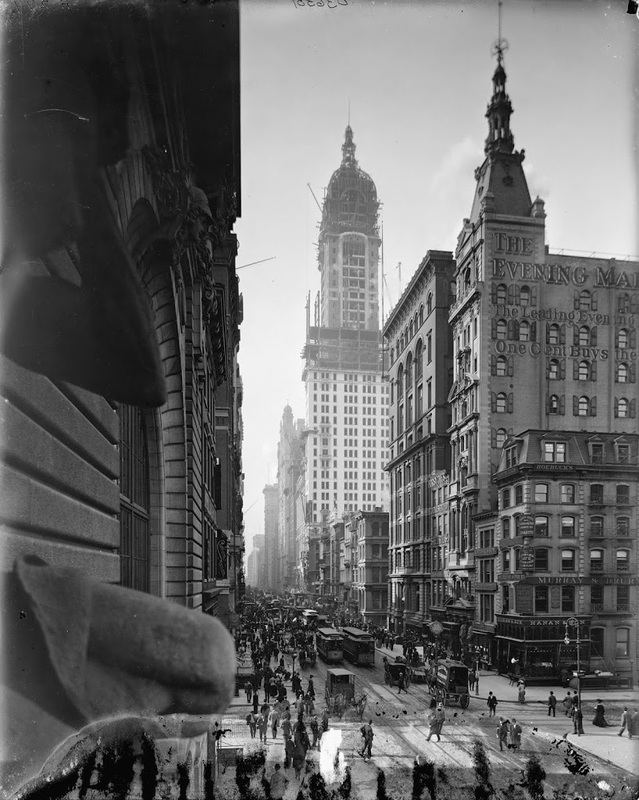 When it was completed in 1908, the Singer Building was the tallest in the world, although it lots its title just a year later, when the uptown Metropolitan Life Insurance Company Tower was completed. It was the headquarters of the Singer Manufacturing Company, of sewing machine fame. It was demolished in 1968, and to this day holds the title of the tallest building ever intentionally demolished by its owner (the qualifications being necessary because of the destruction of the Twin Towers on 9/11, right across the street from the location of the Singer Building). It was replaced by the architecturally-insignificant One Liberty Plaza, the black skyscraper in the center of the photo. Because of its location opposite the World Trade Center site (the right-hand side of the building from this perspective), it received some minor damage following the September 11 attacks. Incidentally, there is at least one building that is visible in both photos – the Trinity Building, with the cupola, visible just beyond One Liberty Plaza, was completed in 1905 and still stands today.